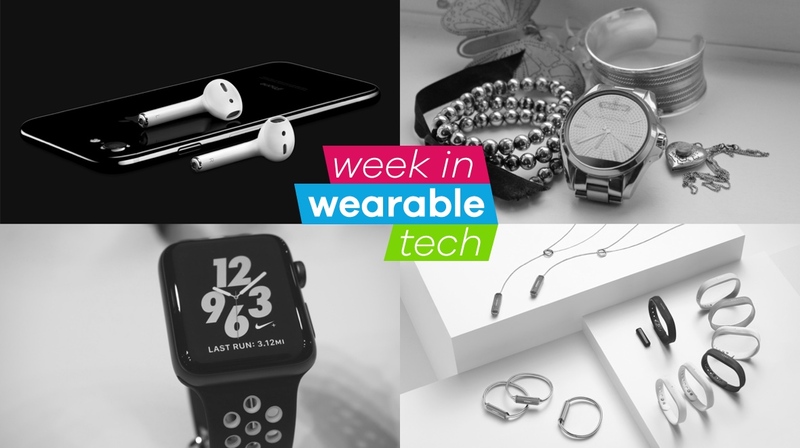 It's been a mega week for wearable tech with the next-gen Apple Watch going live. But the news agenda wasn't totally dominated by events in Cupertino. There's been plenty of other things going on. It's finally here. After months of speculation, Tim Cook and the gang took the covers off of the next-gen Apple smartwatch. The Apple Watch Series 2 adds some pretty big new features. The big news on the design front is that the Apple Watch Series 2 will be waterproof this time. For swimmers, it will have both pool swim and open water swim options. And for runner, the built-in GPS means accurate distance and pace stats without needing to be hooked up to your iPhone. Check out our Apple Watch Series 2 hands-on for more info. The Apple Watch Series 1 is also a thing now. It's basically the original but with a faster processor... and a lower price. The Apple Watch Series 2 wasn't the only new wearable coming out of Cupertino this week. The wireless Apple AirPods are button-less; double tapping on an AirPod will let you access Siri to select and control your music, change the volume and check your battery life. It's not quite the advanced hearable we'd hoped for but it's a start. We'll stick with our Bragi Dash for now. Apple still has a long way to go before it catches up with the wearable market leader though. Fitbit is still out in front, according to new data from IDC. Its second-quarter data on wearables shows a 26.1% growth in the overall wearables market between April and June. However, while 'basic wearables' climbed up 48% over the same quarter last year, 'smart wearables' dropped 27.2% year on year. The introduction of the Fitbit Charge 2 and the Fitbit Flex 2 will surely only strengthen its position. The Michael Kors Access Android Wear smartwatch line was announced earlier this year and the first models - the Bradshaw and the Dylan - are now on sale. The new Michael Kors Access duo cost from $350 and there are a few design variations to choose from. Have a read of our comprehensive Michael Kors Access smartwatch review for all the details and our, all-important, verdict. The Pokémon Go Plus wearable, which lets users interact with the augmented reality game from their wrist, will launch on 16 September. The device connects to your phone via Bluetooth and blinks and vibrates when you're near a PokéStop, and flashes when a monster is close by. The Plus was delayed from its originally-scheduled launch at the end of July, but the timing might be unfortunate for two reasons: the game has lost a lot of players since its initial wind, and Niantic just announced a Pokémon Go Apple Watch app. Billed as a Bluetooth 4.0 "digital post-it note", Dot talks to your phone and can, for instance, turn on a LIFX smart bulb when you enter a room or tweak Nest settings for how you like the temperature. Kind of like your own personal iBeacons set up, without the advertising that comes with it.